All that remains of Victory Hotel, are just a few exposed pieces of brick and stone, and some markers within South Bass Island State Park. The Victory Hotel was at one time the largest summer hotel in the United States. Built in 1892, it had 600 guest rooms with a dining room capacity of 1,200. Located on South Bass Island, the Victory Hotel even had its own trolley line that was built to deliver hotel guests and their luggage to and from the steamboat landing the 1.5 miles to the Hotel's big front porch with the word "Welcome" lobby. The cornerstone for the hotel was laid on September 10, 1889, which happened to be the 76th anniversary of Perry's victory of the British in the War of 1812. In fact, this was done on purpose as the hotel's name was to celebrate that victory and hence its name Hotel Victory. 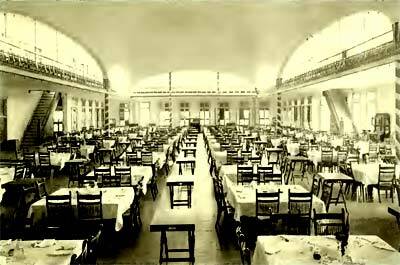 ABOVE: Victory Hotel's main dining room could seat up to 800 people at one time.